We are excited and celebrating! One decade down and many more to come! 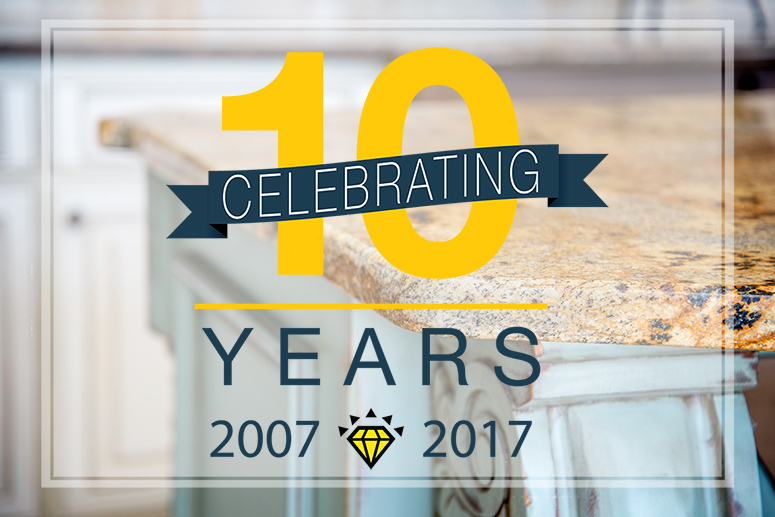 At the end of September, 2017, East Coast Granite & Tile will be celebrating 10 years of successful business operations! Over the past ten years we have transformed kitchens and bathrooms, numbering in the tens of thousands, for satisfied customers across the Upstate. Our projects range from residential, retail, and community living. With each project as unique as the project owner, we offer a large selection of countertop options in granite, marble, and quartz. Not only do we supply custom countertops but we also install tile flooring, tile backsplashes and custom cabinets! We are very proud of our business accomplishments and becoming the Upstate of South Carolina area’s number one kitchen and bathroom renovation specialist! In this article we want to review our history and then speak on our future as a business. Ivan Karastanov and Ivan Greck founded East Coast Granite & Tile in 2007. During a tough economical time both Ivan K. and Ivan G. worked extremely hard starting with a location in Boiling Springs, SC then expanding to the westside of Spartanburg County. Over the past ten years, the business has expanded into many different locations around Greenville County. However, we didn’t just stop there. We opened locations in Greenwood and Pickens County. We are now represented as far as Newberry, SC covering practically the whole Upstate of South Carolina. We are eager to watch what the future holds! In our ten year experience of running our business we know that we wouldn’t make it this far without out great customers. Our customers not only provide us the opportunity to help make their dream home a reality, but they recommend us to their friends and family. It means a lot to us here at East Coast Granite & Tile knowing that we earned your trust. As we have earned that sacred trust of transforming a home into a dream home we do not ever want to betray that trust. We work hard daily to provide the absolute best customer service we can deliver to any customer that comes to us. We are dedicated to being there at every stage of a project. Our sales professionals pride themselves on putting every client question, concern, choice and decision at the top of the list, we want your project to flow as seamlessly as humanly possible. Each of our locations are staffed with experienced and knowledgeable professionals happy to assist customers from layout ideas, material choices, also details such as sink layout options and countertop edge profiles. With each of our stores thinking about the next ten years, we are taking feedback from our clients and implementing better store level practices to better assist with the purchasing process. Thanks to our professional sales and management teams being tirelessly dedicated to providing superior customer service to each and every client our customers not only feel comfortable but confident in purchasing the correct materials for their renovation project. Our team utilizes their time away from customers to learning the latest trends within the industry as well as staying on top of projects that are in process. Ready to get started? Find the location closest to you. Customer experience will continue to be our motivation as we move through the next decade. With that being said, everyday we are working harder to implement even better tools for communication so that all projects stay on schedule and nothing ever falls through the cracks. Implementing these better business practices ensures better accountability, scheduling, and reduces any waste in the process, making the customer experience more informative and less stressful. At East Coast Granite & Tile we pride ourselves on being the leading edge of industry technology. We continually advance and push ourselves to be more accurate and keeping waste to a minimum helping to keep cost to the minimum. We will continue to work to create cost savings so that we can pass the savings onto our customers. In closing we would like to reiterate our gratitude to all of those who have helped us get to where we are! Our loyal customer base is our greatest focus and motivation. Thank you all for the past ten years they have been great! We look to a bright future serving more of the great people in the Upstate of South Carolina.